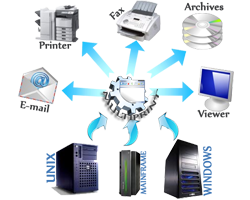 MultiPrint is a print management software which is appropriate to different operating systems and which work up with all editing technologies. MultiPrint contains all the tools that will help you cover all your needs for print management on UNIX and Windows. MultiPrint allows you to optimize printing ressources, empower users, automate the distribution of documents and manage all printers in your company, anywhere in the world, from a single workstation. MultiPrint is the ideal tool to build a printing service completely centralized, hierarchical and secure. In fact, MultiPrint is modular and scalable, dedicated to the printing management services in a distributed environment. It consists of a range of modules designed so that their judicious combination associated with custom settings, allows it to bring a print management service powerful and perfectly suited to the system information architecture and different modes of use (user profiles, organizational rules ...) in the target environment.